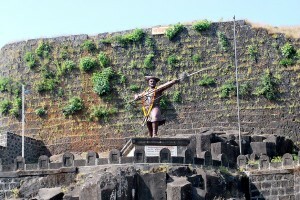 Panhala fort is situated in the district of Kolhapur of Maharashtra and is famous as tourist spot. The city is very small and located in the fort and you can see the attractive beauty of the valley. It has several historical backgrounds and now it has become one of the renowned tourist attractions in Maharashtra. You can reach this city of Panhala by air as well as rail or by road also. It is well connected with Kolhapur. The place is popular for several festivals like Ganesh Chaturthi and you can get to know about the rich culture of Maharashtra by visiting the place. Panhala is popular for its enriched heritage as historical backdrop and monuments along with chivalrous forts. If you love trekking you can choose Panhala as it is perfect place for it. If you do not like the concrete jungles you can spend your weekend in Panhala as there is serene atmosphere and scenic view is just awesome. It is not like usual hill station you can find it very peaceful place to enjoy the natural tranquility. This hill station is unique in nature for the people who are in search of the place to relax completely from the hectic schedule.